Donald Trump got oh-so-excited about a former member of the Obama administration, Gregory Craig, being indicted this week. 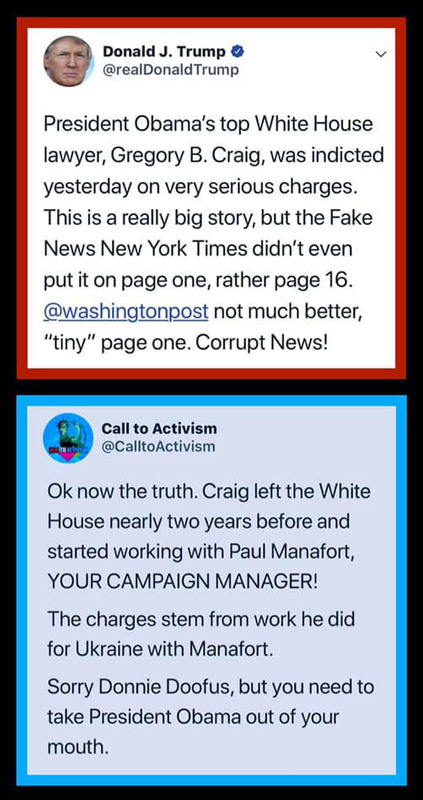 As Call To Activism points out, though, the charges against Craig came from his involvement with former Trump campaign manager Paul Manafort years after leaving the Obama administration. The indictment alleged that, while a partner at Skadden, Arps, Slate, Meagher & Flom, Mr. Craig took on work on behalf of the government of Viktor F. Yanukovych, then the president of Ukraine. The work was brought to Mr. Craig by Paul Manafort, then a political consultant for Mr. Yanukovych and later the campaign chairman for President Trump in 2016. The charges stated that Mr. Craig lied in order to avoid registering with the Justice Department under the Foreign Agents Registration Act and withheld information about the full scope of his activities.